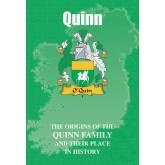 Discover the history and origin of your Irish clan and family history with these fun entertaining and easy to read mini books. Authored by our very own experienced journalist/historian these books describe the origins of your family name in a light hearted and informative fashion. Presents for all the Irish family. With origins enshrouded in mysterious myth and legend, the O’Haras were present from the very earliest times on the ancient soil of Ireland. Their ancestry is truly noble, descended as they are from warriors and kings, while they were ever ready to raise the sword in defence of their freedom. The proud tale of the O’Haras, who are to be found all over the world today, is recounted here. NAME VARIATIONS INCLUDE: Ó hEaghra (Gaelic), O’Hare, O’Harra, O’Hehir, O’Hora. ..
County Cork, in the ancient Irish province of Munster, is the original homeland of bearers of the proud name of O’Keeffe, in all its variety of spellings, who are scattered throughout the world today. But the clan’s fortunes were dealt a series of devastating blows at the hands of ruthless and ambitious invaders, with many of the name paying dearly in defence of their freedoms and loyalties. Read here the dramatic and inspiring tale of the O’Keeffes. 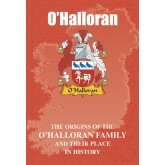 NAME variations include: Ó Caoimh (Ga..
With an ancient history infused with colourful high drama and romance, the O’Learys of today are heirs to a truly noble heritage. While some of the proud name have gained distinction on the bloody fields of battle, others have made an enduring contribution to the great Irish literary tradition. The inspiring and poignant tale of the O’Learys is recounted here. 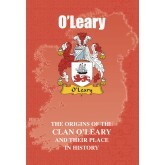 NAME VARIATIONS INCLUDE: Lary, Laury, Learey, Learie, Leary, O’Leery, O’Laoghaire (Gaelic), O’Laoire (Gaelic), O’Laohaire (Gaelic.. The O’Sheas are particularly renowned as having been the most noted of The Ten Tribes of Kilkenny – but it is was in what is now the county of Kerry, in the ancient province of Munster, that they first stamped their mark on the pages of Ireland’s history. Of truly Celtic pedigree, their colourful saga is infused with stirring myth and legend. The dramatic tale of the O’Sheas is recounted here. NAME VARIATIONS INCLUDE: Ó Séaghdha (Gaelic ), Ó Shéaghdha ( Gaelic), O’Shee, McShea, McShee, S..
With origins deeply rooted in the ancient soil of Ireland, branches of the O’Briens nevertheless often found themselves on opposing sides in the bitter and bloody wars that periodically wreaked havoc on their homeland. 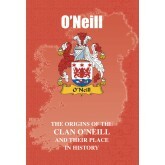 But what they had in common was a proud descent from one of Ireland’s greatest warrior kings. In contemporary times and in literature, Edna O’Brien, considered to be one of Ireland’s greatest living writers, is the novelist and short story writer w..
Bearers of the O’Dowd name can proudly look to Ireland for their ancient roots and a descent from one of the island’s greatest warrior kings. Defending hearth and home from invaders, they were involved in several of the island’s bloodiest battles, while in later centuries many forged new lives for themselves through a diverse variety of pursuits. Born in 1969 in South Africa, Cathy O’Dowd is the climber and mountaineer who is the first woman to have reached the s..
Stalwart in defence of their ancient rights and native Gaelic culture, the O’Dwyers and their namesakes the Dwyers were for centuries at the forefront of some of the most dramatic episodes in Ireland’s frequently turbulent history. This was often at great cost to themselves, but they managed to survive and thrive through a wide range of more peaceful pursuits and endeavours. In medicine, Joseph O’Dwyer was the American physician who left an enduring legacy throug..
An Irish clan whose lineage is truly noble and whose history is entwined with that of the Emerald Isle itself, O’Hallorans are to be found scattered across the world today and have achieved fame and distinction through a colourful variety of endeavours and pursuits. A former boxer who fought under the name of ‘Irish Jack O’Halloran’ Jack O’Halloran, born in 1943, is the American actor who as a heavyweight boxer from 1966 until his retirement from the ring in 1974, went un..
With a descent from heroic figures whose exploits are the very stuff of colourful myth and legend, the O’Neills of today are heirs to a unique heritage. For centuries at the forefront of key events in Ireland’s history, they experienced both fortune and misfortune, while many have subsequently achieved distinction at an international level. 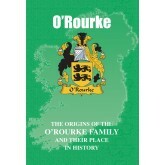 A number have made their mark on the world of literature, particularly the great American playwright and recipient of the No..
One of the principal clans of the ancient Irish province of Connacht, the O’Rourkes can claim an illustrious descent from one of the island’s most remarkable warrior kings. Fighting at great cost to themselves for the preservation of their freedom and independence, many were forced to forge new lives for themselves on foreign shores, where their descendants flourish to this day. In the creative literary sphere, Patrick Jake O’Rourke is better known as the America..
From tales of the legendary Conn of the Hundred Battles to tales of the great eleventh century warrior king Brian Boru, the history of the Quinns is infused with high romance and drama. Members of the ancient Gaelic order of clans, they played significant roles in some of Ireland’s most bitter and bloody conflicts, but survived to flourish across the globe today through a rich and colourful range of endeavours and pursuits. On the silver screen Anthony Quinn, bor..
With a heritage closely bound to some of the earliest and most dramatic episodes in Ireland’s history, the Reagans can be regarded as a truly native Irish clan. 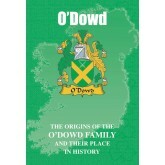 Their ancestry is illustrious, while their defence of their ancient rights and privileges was stalwart. 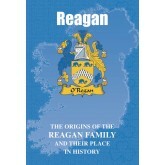 The proud tale of the Reagans is related here. NAME variations include: Ó Ríagáin (Gaelic), O’Reagan, O’Regan, Regan. ..
Their chieftains were inaugurated on the site of what is thought to have been a Druid temple, while they are linked through colourful myth and legend to some of Ireland’s great heroic figures. Brave defenders of their ancient rights and privileges, the Reillys were inextricably linked with both the island’s great fortunes and its tragic misfortunes. Their bold and stirring tale is recounted here. NAME VARIATIONS INCLUDE: Ó Raghailligh (Gaelic), Riley, O’Reilly, Rahilly, Raleigh. ..
With origins that stretch back through the swirling mists of time to an age before recorded history, the ancient roots of the Rooneys of today are shrouded in colourful myth and legend. But when myth and legend give way to historical fact, it is revealed how this clan were at the forefront of the determined Gaelic-Irish struggle to preserve their rights and privileges – often at great cost to themselves. Read here the proud and stirring tale of the Rooneys. NAME VARIATIONS INCLUDE: Ó Rua.. 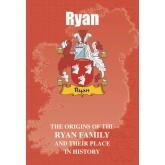 While their origins are enshrouded in myth and legend, there is nothing mythical about the exploits down through the centuries of proud bearers of the surname of Ryan. One of the original native Irish clans, they suffered dearly in the cause of their ancient rights and proved stalwart defenders of their freedom and independence, often in the face of overwhelming power and aggression. In more peaceful times but taking war as his subject, Cornelius Ryan was t..